Facebook made a couple moves last week that were immediately categorized as in reaction to Google+ features. They include easier group management and the ability to make personal profile posts public and let people subscribe to your publicly shared posts are clearly a nod to Google+ functionality, but here’s the deal – it’s not what Facebook is about and trying to copy Google+ is probably more of a threat to Facebook than staying true to its roots. For the most part, Facebook users don’t really want to manage groups and decide who gets to see what – they just don’t friend people outside of their circle. This actually adds a layer of thinking that cuts at the very way the core users manage their Facebook use. Facebook built its empire by staying very true to the friend-sharing model and creating the best technology. You could argue that the user interface is a bit clunky, but no one can argue with the fact that even at 600 million plus users, sharing increasing amounts of data, Facebook’s engine works. Sure, millions of people are jumping on Google+, but as it turns out for something different than Facebook. I personally find Google+ to be a better experience for my needs than Facebook, but I am not a typical Facebook user. From a business use perspective I find Google+ interesting and useful, but I am still very bullish on Facebook as a platform to reach consumers and extend a small business brand. Just this past week, I received friend requests from several family members who were just now stepping into Facebook as a method of keeping up with friends and family. 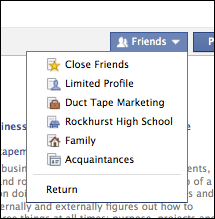 That’s what makes Facebook too useful to fail any time soon. And that’s the usage Facebook should take to the bank. Imagine the inertia required for a twenty something to move their entire social communication habit, and that of their entire social and quasi-social circles. For many in this group, Facebook has been the only means of communication with friends they’ve employed. Sure, people were on Friendster before Facebook came along, but social behavior prior to Facebook was simply something people did in pockets – now they do it as entire families and as a way to stay in touch with pretty much anyone they choose. Sure, Google+ is a still a very cool with its core audience – heavy Internet and social media users. Facebook stopped being cool with its core audience, college students, the day it let me in, but that hasn’t slowed their use. In a way Facebook owns their ability to communicate beyond text messages and that’s what Facebook should focus on. Like it or not, Facebook tightly controls the best audience data machine ever created and a platform for tapping that data that should ensure they are hugely profitable for years to come, unless they forget what got them here and start chasing every competitive force in a move that may render them less useful to those the built it.